WINONA LAKE – A dominant third quarter was all that Grace’s women’s basketball team needed to displace Goshen 69-43 on Tuesday. The Lady Lancers (13-12, 7-6 Crossroads League) continued their late-season surge with their third consecutive win. As a result, Grace has climbed into a tie for fifth place in the league standings. Brooke Sugg was electric for Grace, scoring 26 points with six 3-pointers to lead all players. Grace’s offense was sluggish to start Tuesday’s contest. The Lady Lancers missed their first eight shots and did not score for nearly five minutes. Vironnica Drake finally broke Grace’s slump with a free throw, but Grace’s first field goal did not come until a minute later. The Maple Leafs (8-17, 1-12 CL) took advantage to lead 8-1. Kaylie Warble gave Grace a small boost off the bench with three points, but Goshen was still on top 12-8 at the end of the period. Grace’s offense was stagnant again for the opening minutes of the second quarter, and the Maple Leafs owned an 18-11 lead. Kamryn Hostetler helped Grace back into the game. She made a jumper and then muscled her way to an and-1 to trim the deficit to two. The Lady Lancers took their first lead of the game thanks to the shooting of Sugg. She hit a triple at the top of the key, and then soon after hit another long jumper for a 23-22 lead. Grace maintained that lead into halftime by the score of 28-24. Sugg’s seven points paced Grace, who only committed three team turnovers in the half. The victory was essentially secured for Grace with a decisive third quarter. The Lady Lancers erupted for 28 points in the quarter, equaling their production from the entire first half. Sugg was lethal for the Lady Lancers, scoring 14 points in the stanza. She buried four 3-pointers in the quarter, highlighted by a trio of treys in the span of 2:09. Sugg’s final 3-pointer gave Grace a comfortable 23-point lead entering the last quarter. The fourth quarter was more evenly played, but the damage against Goshen was already done. Grace’s defense stymied Goshen in the fourth quarter to just 10 points. The Lady Lancers coasted in the fourth quarter on their way to a 26-point rout. Sugg shot 50 percent from the floor for her 26 points, going 10-of-20 from the floor and 6-of-12 from beyond the arc. She added three steals and three rebounds. Hostetler produced 11 points, 4 assists, 3 rebounds and 2 steals, and Drake added 10 points and five boards. Brooke Treadway led Grace in rebounds with seven, adding two steals, and Kyannah Stull buried a pair of 3-pointers for eight points. Pam Miller grabbed five rebounds and scored two points, Lauren Godfrey had four points and four assists, and Warble added three points and five boards. 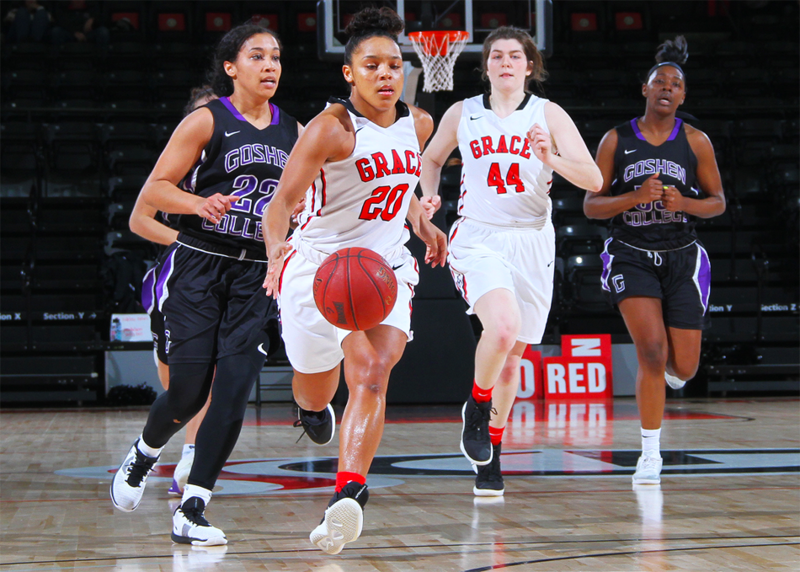 Grace shot 42 percent as a team and 40 percent from beyond the arc. Goshen shot 32 percent and 6 percent from beyond the arc (1-of-18). Goshen was also at a major disadvantage in turnovers, committing 20 turnovers compared to eight for Grace. The Lady Lancers end the week on the road, playing at Bethel as part of a doubleheader. The women’s game will start at 1 p.m.